La plaza Olavide is a great place to pass by at any given time. 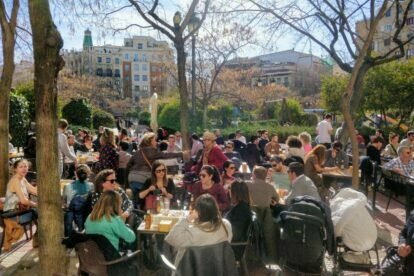 It’s a spectacular green pedestrian square in the middle of the cemented neighbourhood of Chamberí, making it a popular location. No cars are allowed on the square and its unique form provides a feeling of openness very much needed in the middle of a city such as Madrid. It’s full of playgrounds for kids, benches and trees, giving it a more gentle feeling, and it’s a perfect location to watch how locals live day by day. Activity at this location is guaranteed! Plaza Olavide has many bars to go to in the square and its surroundings. I specially like la Oliva due to its location on the square. Strategically, I would say it’s the bar with the most exposure to the sun. The buildings are high, so the sun can be easily blocked, but not at the Oliva. I sit at the terrace and let the time pass — you can easily forget time exists here! When la Oliva is full, please lie back and enjoy all the conversations and activity surrounding you, as waitering will be almost inexistent. So please be patient. You may find people reading the newspaper slower than a snail attempting to run a marathon. Learn from them, bring down your pulse, and relax.